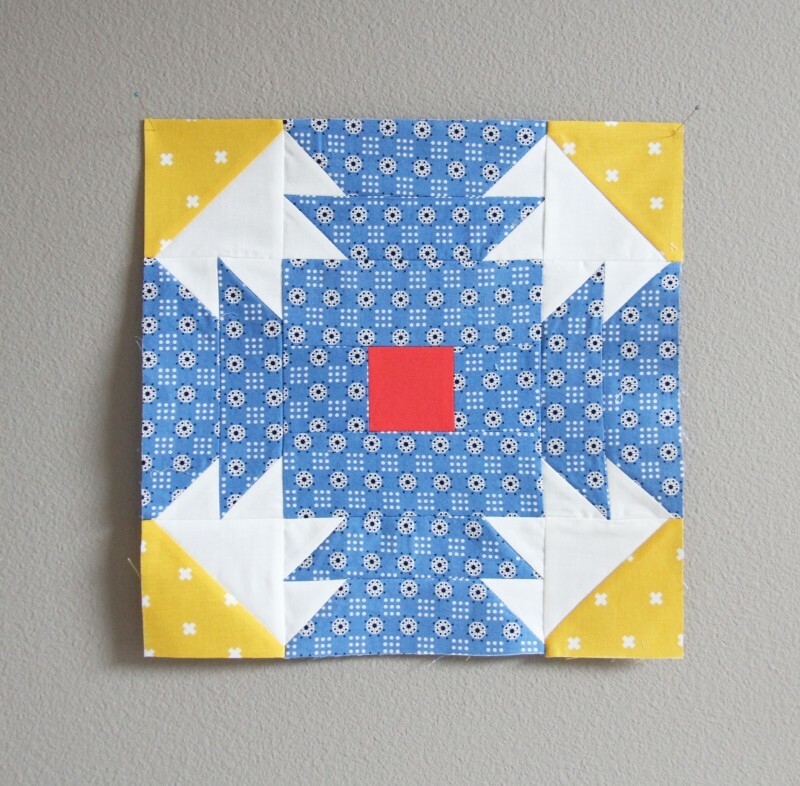 For those of you that are sewing along with the Summer Sampler, one of my blocks should have been emailed out today! 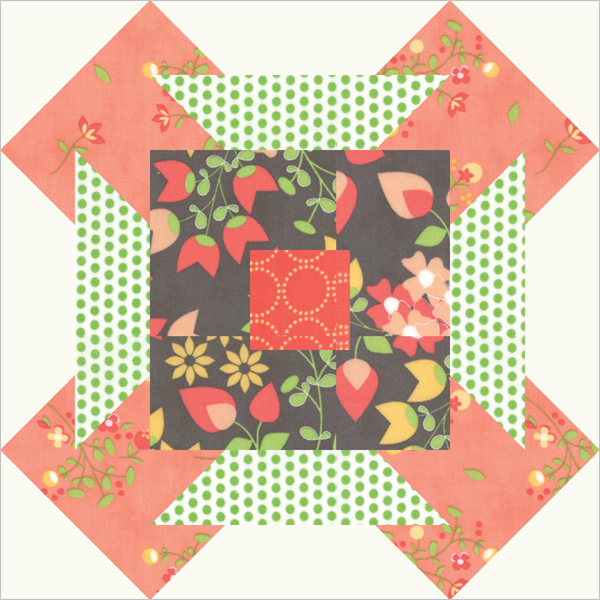 This one is called Summer Slice, and I figured I’d show you the block I sewed up and a couple of variations. I actually like this one in Sweetwater’s Treehouse fabric better than the one I made. I just added two different fabrics for the edge pieces instead of all one fabric. This one looks totally different, but the only difference is the white is now the print, and the outer edge strips are now white. Kinda of fun to see the differences! I just knew you were enjoying that baby. Praying when she decides to arrive your delivery goes easy and quick! The block is cute! Oh my! They do all look so different just with the play of the fabric choices…tough to say which I like best because I like them all! As for baby…the waiting can feel oh so long ….wishing you well as you await the delivery of your last little one…such a wonderful time for your family…another miracle and blessing. Three completely different (and fantastic) looks! How will I ever decide what to do with my block? Good luck on waiting for baby…my first was 5 days past my due date and my second was 2 days overdue, so I know exactly what you mean about being done with pregnancy! I hope you can relax and enjoy the time you have left. Good luck with baby, I am so excited for you. Hopefully your little bundle come quickly! :) I love your block, and yes, that is fascination how one block can look so different depending on the fabrics. Still no baby girl? Oh my goodness! Take it easy… she’ll be here soon!!! What a difference fabric placement can make! Great block! Thinking of you in the days to come! Where do I find instructions for all 3 variations of the Summer Slice block? They don’t even look like the same block! But they are all just gorgeous! All the best on your delivery!! No baby yet?!?? The last few days must feel like years. Hope baby girl decides to come soon. In the meantime, I hope you have a chance to put your feet up and take a nap. Hahahaha! As if, right?!? Sending big hugs! This is a great block! Thanks for including the variations. It’s always interesting how the placement of fabrics can give such different looks. I am loving the blue and yellow with the coral center. I love these fabrics. Love this block, especially in Treehouse! Is that a mock up you did on the computer? May I ask what program? I’d love to be able to do that. Hang in there during these last few pregnant days! OK, Allison, here’s wishing you the very very best! BUT also, I LOVE the first block the most! am I weird? no just from Ashton…huh! I love your first block the best. I wish you the best while you wait for your baby to come. Enjoy the babies when they are little since they grow up so fast! 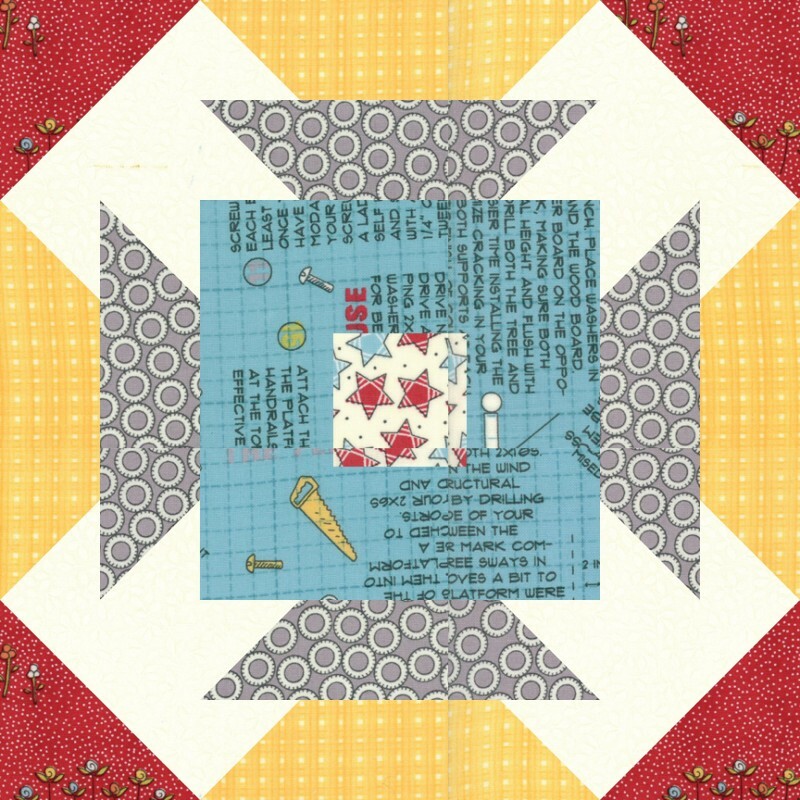 I especially love the first block in those fabrics! And hope the baby makes an appearance soon and that things go very well for you. Hope your little bundle of joy arrives very soon and your delivery will be easy and quick! Looking forward to meeting her. Love your block and the other ones as well. My youngest son was due on Christmas Day of 1978. Born January 29th of 1979. Ten months and four days later, my most amazing little guy was born! Still an amazing man now!